I am due to go diving in the Red Sea in 3 weeks time. About 8 weeks ago, I had an accident and dislocated/sprained my left collarbone. It is probably about 95% healed now, in that it still occasionally feels a bit tender especially if I've rolled over onto my left side at night. I still have a small lump on my shoulder which I am told will now be permanent. I have heard that if you go diving with an existing injury it can increase the risk of a bend in that area. Is this true? Is this something to be concerned about? This is an interesting question. Will an injured part of the body either increase the chances of having a bend in that area or if you are unlucky enough to have a bend, is it more likely that it will occur in the area that you have injured before? Well the answer is that there is no answer! For example there have been studies where divers with earlier cases of DCS that have caused tissue damage are reviewed if they get another hit, and there is little evidence that it occurs where the first bend was. So with your shoulder I don't see how it could either predispose you to a bend. On top of that all the divers I have treated with DCS, many of them have had earlier injuries such as broken legs or sprains but none of them have ever said that the hit was in an area previously injured. So I wouldn't worry too much, just make sure you don't dive unless you have good enough movement in your shoulder so that there is no restriction when you dive for regulator recovery or just pulling any of your dump valves but as it will be at least 11 weeks after the event you should be fine. I would however still use it as an excuse to get someone else to carry all your luggage at the airport. Again make sure he is getting some good physiotherapy to his leg so as to get the muscles there as strong as before. This will stop any unequal tiredness in the legs if he had a tough counter current fin. Lastly he needs a lung assessment to make sure he has adequate lung function to dive. This shouldn't be a problem if he had his blood thinning treatment quickly enough in the hospital. The best person to do this lung assessment is his local diving doctor, information on which is available on the PADI website. I am proposing to go on a diving holiday, but wanted to ensure that I am medically fit enough to go, and wondered if you can help? I had a pneumothorax as the result of a fractured rib, two years ago. I am fully recovered now. Do you foresee any problems? I had a seizure, also at this time, due to a head trauma. This seizure occurred whilst unconscious. I have had none since, and have been declared medically fit to drive. I do not take any medication. Are there any problems with this too? Finally, I sustained some fractures in my pelvis and upper left arm. Both have healed and I have no problems. Am I medically fit enough to go diving????? There are 3 issues here to deal with. As your punctured lung or pneumothorax was as a result of injury, rather than being spontaneous, it is more likely that you will be fit enough to dive. 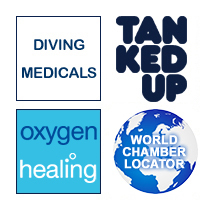 You still need to have your chest examined by a qualified diving physician, and our regulations also call for a CT scan of your chest to make sure that all is well now before we can recommend you dive again. Your seizure is less of a problem. In normal cases of head injury the length of any amnesia or presence of a seizure will decide the lay off from diving time. You have been fine for the last 2 years with no problems , so I think that this shouldn't be a problem to you. Finally the fractures you sustained are of relevance only if they stop you from kitting up on a RIB, or mean that you would not be able to look after your buddy if they had a problem. The other thing to have checked by your diving doc is if there is any residual problems left by the injury which could be mistaken for a bend, by this I mean areas of numbness or joint pain in your pelvis or upper left arm .It's best to have these documented now, so you are not incorrectly diagnosed as bent in the future. So, if the chest CT is fine look forward to getting wet! Three weeks ago I fell over and sprained my right hand. It was crass stupidity really, I was doing the last scenario on my Rescue Diver Course and walked down a steep wet grassy slope. Too busy concentrating on the scenario and not what I was doing !!.. Anyway, St Richards in Chichester thought it was a scaphoid fracture and plastered it for 10 days but a bone scan after the plaster came off showed it was not broken. Since coming out of the plaster my hand has improved in leaps and bounds and I am wondering when you think it would be safe to dive again ? The hospital has signed me off and I am waiting for an appointment for physio. My thumb and wrist are a little stiff and sometimes I get a twinge if I put pressure on the thumb. I think I would cope with diving provided I was careful about what I was doing. Looking at what we should be doing this afternoon, I think I can do all the basic stuff e.g. mask removal, sharing air, buddy breathing but would be best staying away from the kit removal, weight removal underwater. What do you think please? Also, I have just signed up to do PADI Divemaster (yes, the pool skills are this afternoon, hence why I am asking about diving!!).... I was just wondering, is possible for a diabetic to become an instructor or would the HSE consider it to be too great a risk? I reckon I could do as good a job as some of the instructors I have encountered on my travels, if not better and its something I fancy doing on a casual basis (couldn't afford to do it full time !). I just wondered what you thought? So I thought I'd ask before I got too excited by the idea. Is there anything in the HSE medical exam that would preclude me from passing please? The painful wrist is no problem, the scan has shown there is no fracture, so all's well there. I assume it is not so twingy that you can't press all the right buttons and bells so to speak, but if there is a risk you would not be able to press your inflator button don't dive until it's better. But the sad news with diabetes is that the HSE regulations are that an insulin diabetic, or even a tablet controlled one cannot work as a commercial diver. Hmm the South Coat, it sounds tempting, but what with flights to the Red Sea being so cheap!! I learnt to dive last year in Australia where I spent a couple of months.Having really caught the bug, I booked a holiday in Malta last September. Unfortunately a couple of weeks before I fell off my mountain bike and broke my collar bone. The fracture was about 2-3 cm from the medial end of the bone and was complete and slightly displaced. It was placed in a sling for 4 weeks and then a repeat radiograph was taken. A good soft tissue callous had formed and the fracture seemed stable but there was no calcification as expected at this stage. I was sent to the physiotherapist and discharged from the hospital. However, the fracture site remained mildly painful and there was a degree of crepitus. I am fairly active and my job (small animal vet) does involve lifting. I did rest it but about 12 weeks after the fracture I was back on nights which means working with neuro patients - lifting and turning patients - not light at 50+kg sometimes! Just before Christmas when I was back home I went back to the JR and was re-radiographed and surprise surprise the fracture looked the same as it did 4 wks post break. The doctor explained about delayed union etc (same in animals) and was understandably reluctant to jump into surgery. However it is now 6 months after the initial break and there is still crepitus although it is not that painful and I can do 99% of every day things including work. Last time the doctor said that sometimes they leave collar bones in this state - ie still fractured if they are comfortable. My question is ...can I dive with the bone the way it is. ....I do find it uncomfortable to wear a ruck-sack and I anticipate that the tanks/BCD etc weigh a lot more! My worry is that the fracture will become further displaced with the additional weight - is this possible and is it likely to put me in danger? Is there any way that I would pass a medical anyway? I am due back at the hospital soon and I would like to have some idea of what you think as if I am not going to be able to dive without the fracture being stabilised I need to get it sorted. Poor you. Weird that it should take so long to knit itself together. Bad news I'm afraid. I think you should wait until it's fully healed before diving again. There is a lot of strain across the clavicle when you put on a BC with a fulltank.Likewise, the diving principle of being able to help your buddy at all times also means that you should wait, as a bust bone would hinder a long surface tow. There are a few theories as to what can speed up union of the broken ends. Magnetism. Hyperbaric oxygen. Faith healing. Have a surf or ask your orthopaedic surgeon what they think, as you cant go around like this for much longer. At the last resort get it plated, but this can leave a nasty scar. 7 weeks ago I had an undisplaced fracture of my left zygomatic complex (Cheek bone), there were no other symptoms other than a tender area on the face and a slight pressure pain upon sneezing. After 2 weeks there was no pressure pain upon sneezing. I want to go diving in 3 weeks time and wondered what advice you could give me. All seems fine now. You will be 5 weeks post fracture, and so pretty much there on the healing front. All I can suggest is that your mask can sit fairly tight across your cheek bone at times, so make sure you have a nice loose fit. Don’t let it squeeze, i.e. pull even tighter across your face as you descend. Breathe out tiny amounts through your nose as you go down. My boyfriend recently broke his hand, which had pins put in yesterday and is now in a cast. We are going on a diving holiday on Thursday and his surgeon has signed a letter saying he is fit to dive as long as he keeps the cast dry. He bought some waterproof covers which on arrival don't appear to have a proper seal. Do you have any suggestions on ways to keep the cast dry? No doubt he was defending your honour in a mightily chivalrous manner, and thus deserves a good holiday. Apologies, then, but I feel I have to make your boyfriend aware that there’s a few reasons why diving with a fracture is not a good idea. Obviously there can be loss of dexterity in the broken part, making that bumpy ride out to the dive site a little trickier. It might affect your ability to rescue yourself or your buddy, and be more susceptible to infection by marine nasties. Reinjury to the area is possible, as it’s weak during repair, and sometimes the surrounding muscles lose some strength as they waste away a bit with disuse. The other theoretical problem is that the disrupted bone may preferentially take up inert gas, increasing the risk of DCI. So in general I would suggest not diving until the injury is healed and full function is back; a ballpark figure is around 4-6 weeks. However, if it really is the unpostponable holiday of a lifetime, then go for a waterproof cast construction if you can. GoreTex liners can be used instead of the traditional cotton wool and elasticated stocking getup, allowing evaporation but maintaining enough water repellency to permit swimming, baths etc. A fiberglass tape is then wound around the liner to give equivalent strength to the more usual plaster of paris deal. You’ll be glad to hear they come in a wide variety of offensively garish colours too.